It was an oddly lighthearted moment in the midst of a funeral proceeding, a microcosm of the unusual friendship between the 43rd president and the former first lady. Bush also snuck a cough drop to Obama during former Sen. John McCain's funeral in September. 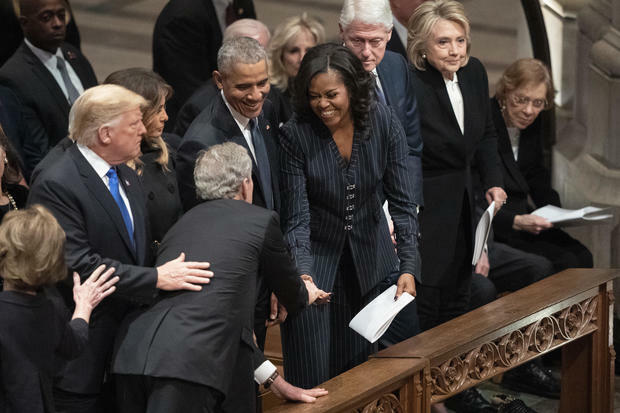 President George W. Bush and wife Laura Bush greets President Donald Trump, first lady Melania Trump, former President Barack Obama, Michelle Obama, former President Bill Clinton, former Secretary of State Hillary Clinton, former President Jimmy Carter, and Rosalynn Carter during a State Funeral for former President George H.W. Bush at the National Cathedral, Wednesday, Dec. 5, 2018, in Washington.